"If you don't have something nice to say, then don't say anything at all." Although this bit of advice doesn't really apply to comedy or good-natured ribbing between friends, it's pretty much sage knowledge that could be applied in almost every situation. But there are some people who take that advice a bit too literally, and always seem to police everything they come across. 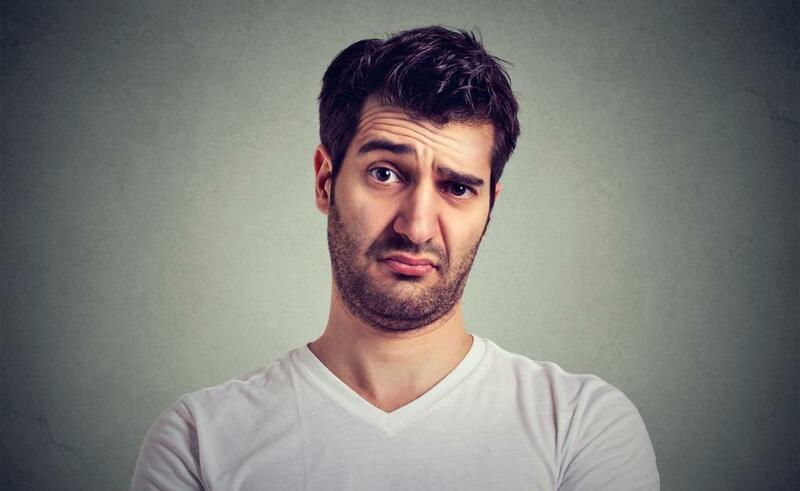 Whether it's news stories, movies, TV shows, plays, tweets, bar conversations, cartoons, whatever, there are throngs of people who are looking to be offended by something. I'm personally not offended by them being surprised I'm Muslim, especially if they didn't grow up knowing a Mustafa or Ahmed or Zainab or Ayesha. I don't even get offended by naive questions about my upbringing and my culture. What I do get offended by are people who assume I somehow have to apologize for ISIS and address all acts of terrorism around the globe. 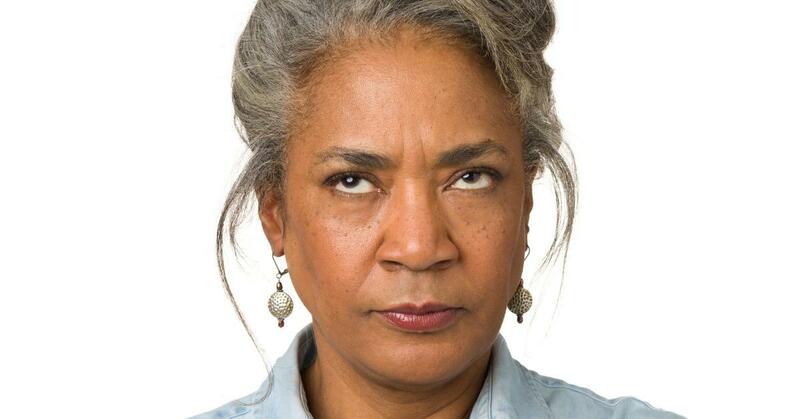 But I'm not going to sit back and try to construe every major cultural phenomenon or movie that comes out or the fact that someone says, "Merry Christmas" to me as an attack on my upbringing and a lack of consideration of my family's faith. That would make me an insufferable nerd. 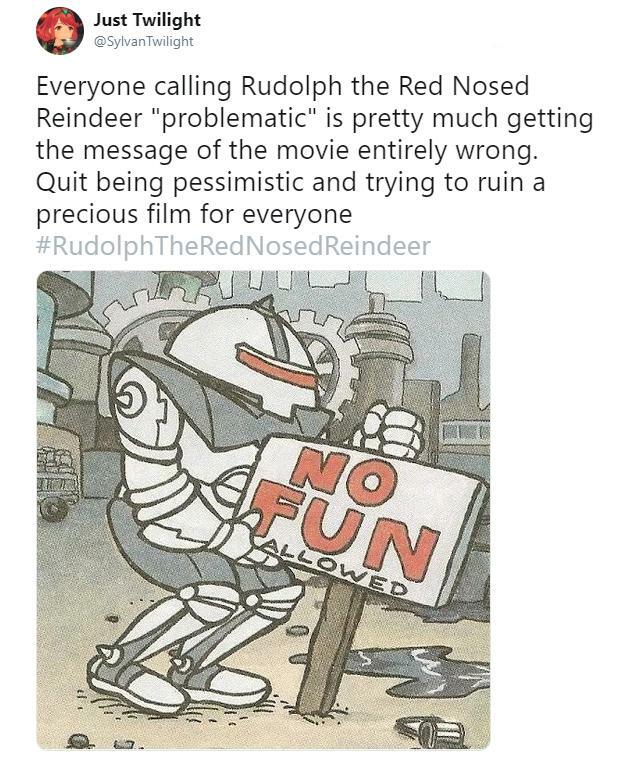 Like whoever's trying to say that the classic story of Rudolph the Red-Nosed Reindeer is problematic because it makes light of a "marginalized" reindeer who is being bullied for being different. 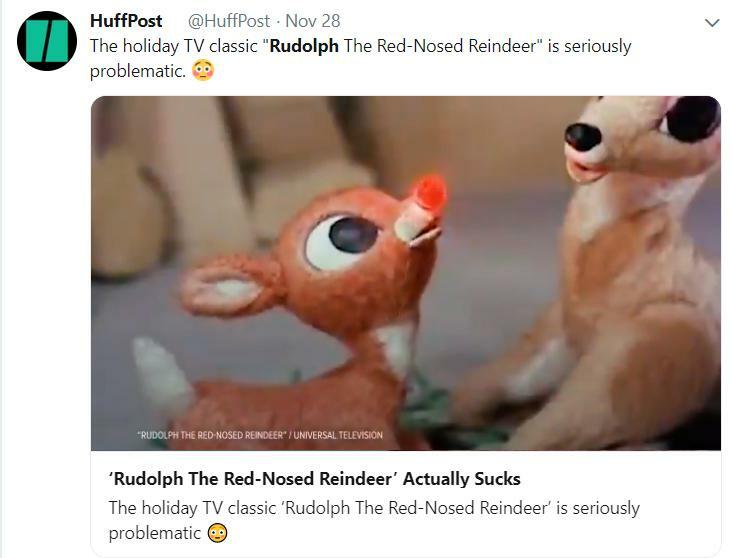 A recent HuffPost article argues the story about the young reindeer with a glowing nose is problematic because he's bullied and ostracized by his peers, only to find salvation and acceptance when his birth "defect" benefits the group. 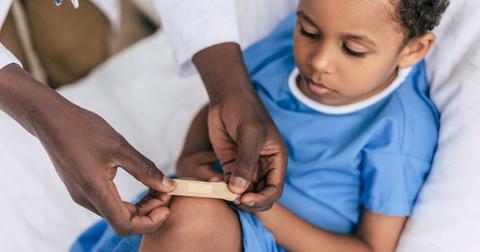 There are some people who agreed that, yes, the story actually is "problematic" and that it could send the wrong message to young children who may believe their "deformities" are only acceptable if they can be exploited by someone else. There are several counterpoints to this argument, too. The most common can probably be best expressed in this quote from actor and comedian Steve Sweeney: "You don't even have to say anything. It's just so absurd." In short: are you friggin' kidding me?! But fine, let's play this overly analytical, let's-waste-our-time-on-this-nonsense game: one must consider the world that Rudolph lives in. He's a flying reindeer who was born to fly and expressed his desire, in the story, to be like the other reindeer. But he was bullied for being different. People get bullied in life all of the time, especially by other kids, and especially if they've got a nose that glows bright red. 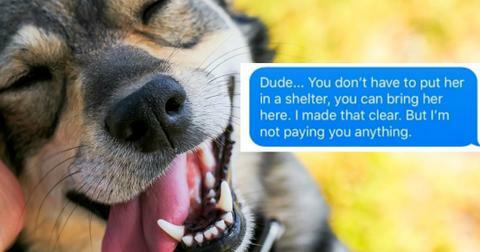 The story isn't one of exploitation, but rather a lesson that what's different about you can be your best asset. 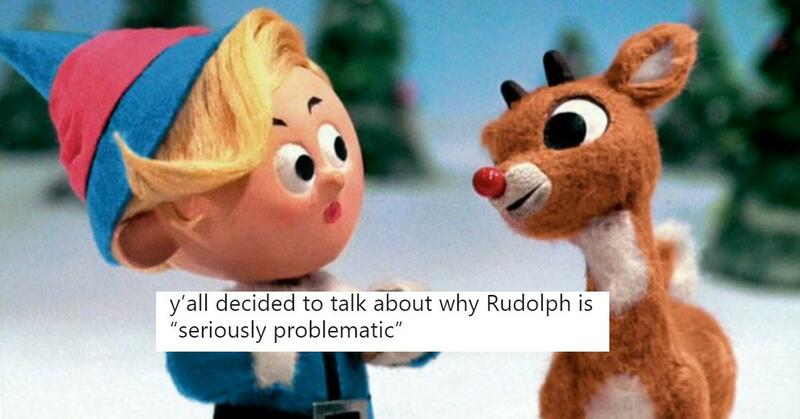 Or, we could bypass all of this Rudolph talk and remember, for a second, that this is a fictional character. 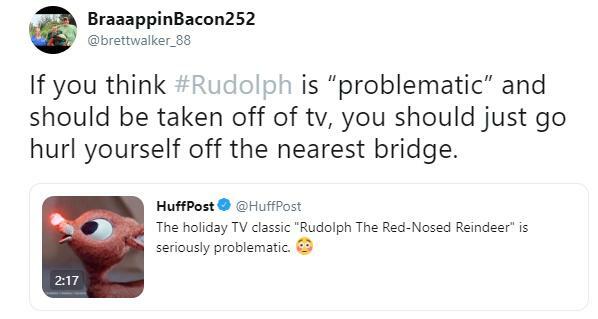 Rudolph isn't the only unlikely figure of social outrage who's popped up recently in the crosshairs of professional crybabies. Believe it or not, Celine Dion is being hailed a denizen of the dark lord Lucifer's domain for the most innocuous reason. When you think of Celine Dion, you probably just think of one of the greatest ballads of all time, and if you're me, you think of her cameo on The Nanny. 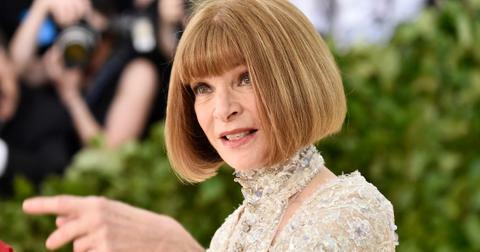 You probably don't imagine she's someone who could be the object of vitriol and hate just because she launched a gender-neutral clothing line. An American priest has declared Celine's CELINUNUNU unisex kidswear line, which consists of sweatshirts, leggings, and t-shirts, is "definitely satanic." To say that the devil talk is a stretch would be an understatement. The offended parties even went so far as to analyze the designs as "proof" of the Canadian singer's special relationship with Beelzebub himself. One offended individual wrote, "one pair of sweatpants has a number 3 on one knee and a 6 on the other. Three 6’s?" Yes, I'm sure that's what Celine was going for when she created her gender-neutral clothing line. It probably has nothing to do with her stated mission to help "younger people to grow on values of equality with the freedom to strengthen their own power of personality based on mutual respect." Pivoting back to total fiction land, there was a recent kerfuffle online about orcs, a made-up group of characters from J.R.R. Tolkien's Lord of the Rings universe. There seems to be a large number of people concerned with whether or not the English fantasy writer is racist against them. No, they aren't saying the Orcs are supposed to be representative of actual Earth races, or that Tolkien has a specific dislike for a certain race or ethnic group for whom he surly, evil Orcs are just a stand-in. There are people who are actually legitimately upset that Tolkien doesn't treat the Orcs with the same respect or consideration that he shows to the protagonists of his story. 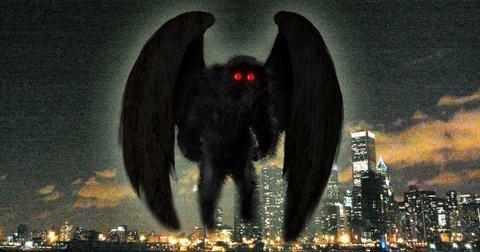 You know, the minions of Sauron who murder the innocent and want to turn Middle Earth into a realm of darkness. 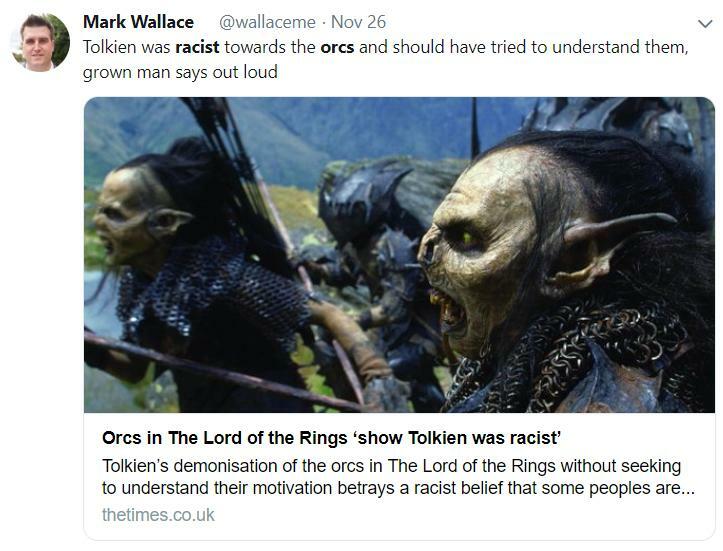 There are definitely people who pushed hard back against this idea that anti-Orc attitudes are perpetuating racism, and others who used it as the perfect opportunity to come up with some most excellent jokes highlighting the absurdity of such a claim. 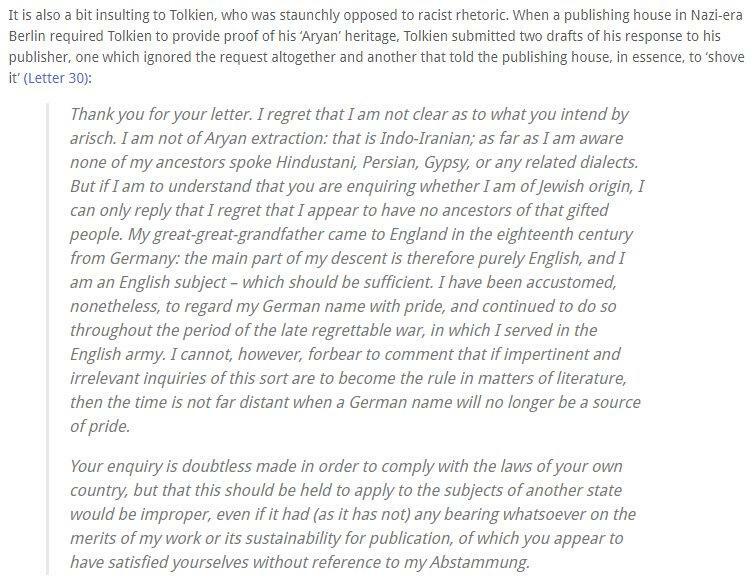 Others used a bit of history to drive the point home, highlighting letters to editors that Tolkien sent, which could have jeopardized his writing career at that point. In them, he strongly denouncing racism and was offended when asked about the origin of his name and ethnic background. 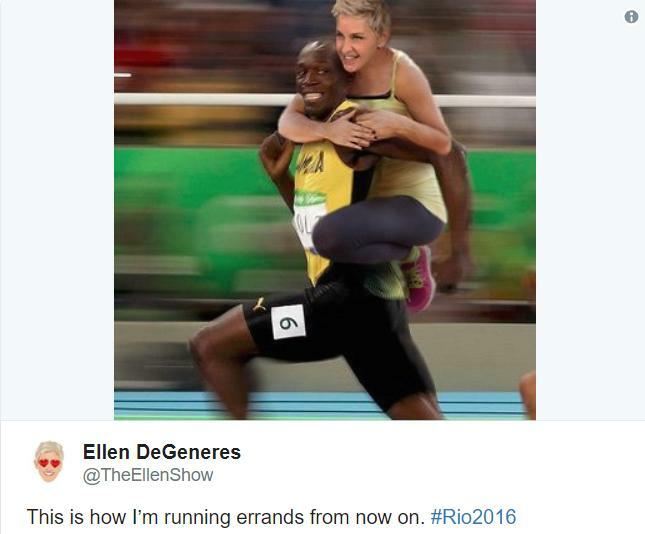 It's hard to also forget the time that Ellen DeGeneres, AKA, everyone's friend, was accused of being racist for tweeting this photoshopped picture of her riding Usain Bolt during the the Rio Olympics. While some who were quick to call for "firing" whoever photoshopped this tweet, others stated what was obvious: Ellen isn't racist and is nothing but a big sweetheart towards pretty much everybody she meets. Then there are people who believe that because they disagree with something or someone disagrees with them, that they're being persecuted. 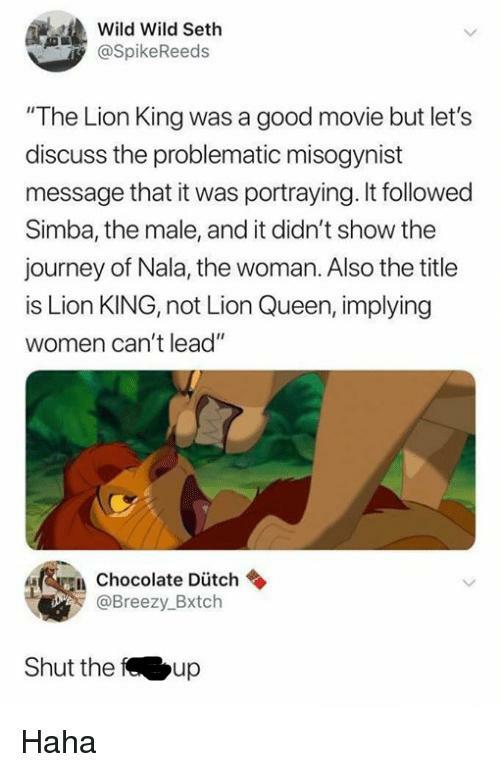 Or that if a children's movie wasn't scripted the way they liked or focused on the characters' they wanted, it's automatically "problematic." What do you think? Are these people just electing to find offense in things that aren't even offensive all for the sake of virtue-signaling? Or do they make some legitimate points?